We didn’t plan to go here. 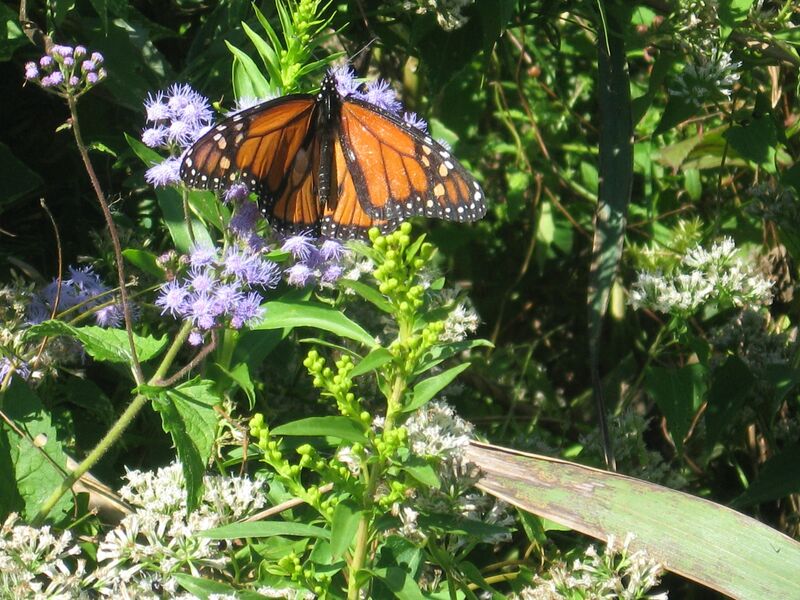 We spent the weekend in Wildwood, and the local paper mentioned that there were Monarch butterflys migrating and Cape May Point State Park was described as being a good place to watch this event. The Wildwood Roar To The Shore motorcycle weekend was a pleasant surprise for us as well, we had no idea we would be surrounded by bikers and their polished chrome machines. 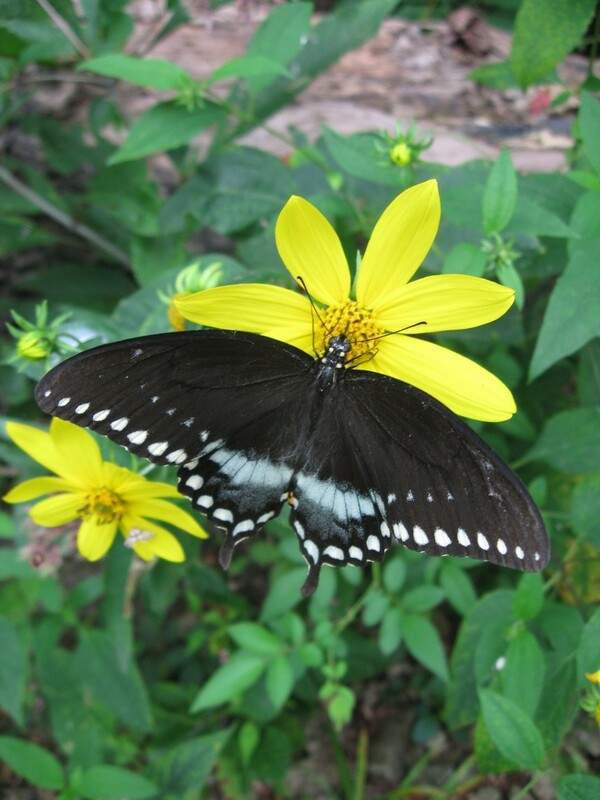 We did learn some about the world of bikes from our neighbors who were pleased to show their artistic customized creations to us, but by sunday afternoon, the butterfly migration in nearby Cape May promised a quiet experience, and this was indeed fulfilled. This is the setting. The Cape May Times had a very welcoming description of the park and what to expect. We did not bring binoculars, but the informative folks at the Cape May Bird Observatory had staff on site who pointed out the birds and handed out loaner binoculars. 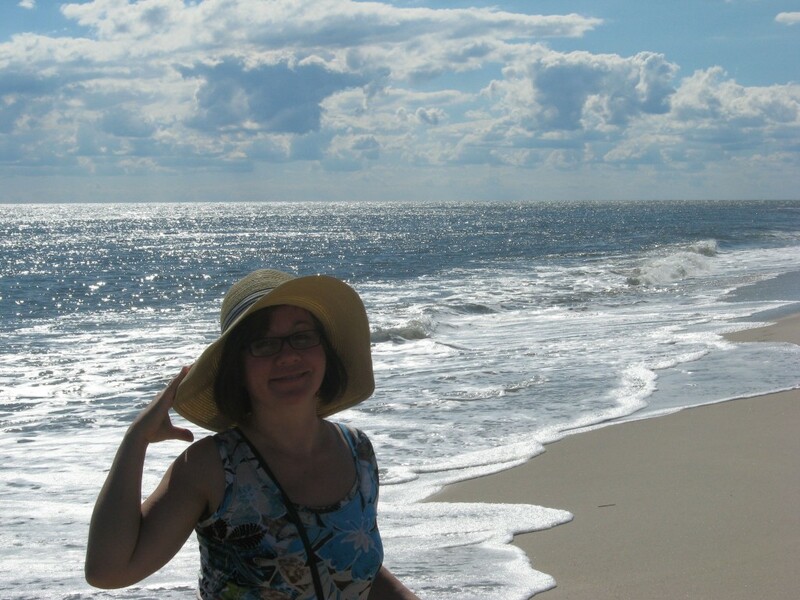 So even if you are not a birder, you will become a guest birder at Cape May Point State Park. 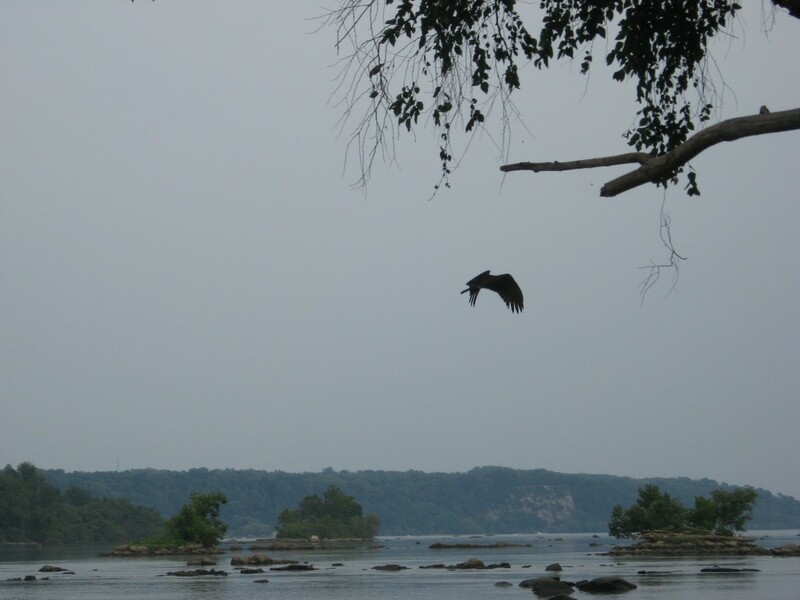 We got to see Eagles flying really high up in the sky on the specially built bi-level birding deck, packed with birders and fully staffed with knowledgable people offering a wealth of information about birds. If you like birds, this is the place. We then ventured into the habitat that supports the birds. Hibiscus moschutoes, in full bloom. 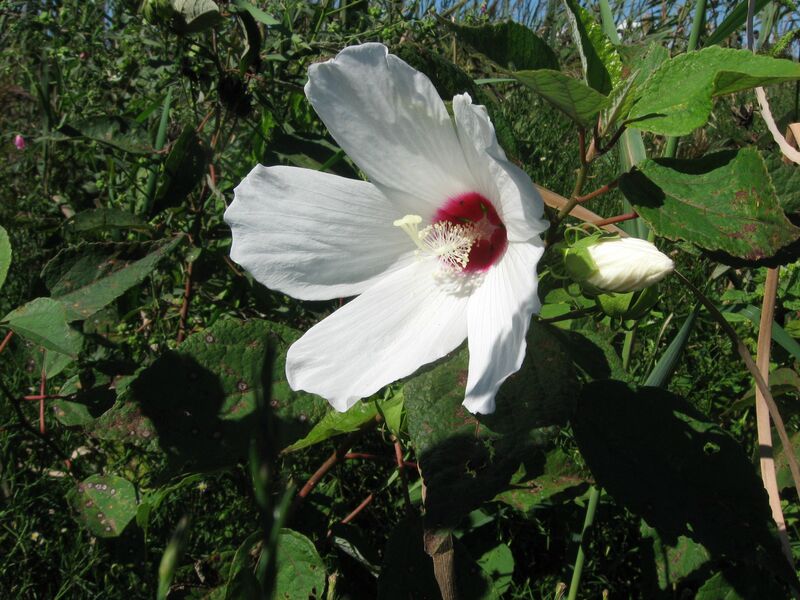 The freshwater marshes had a bounty of blooming Hibiscus. The trails were very pleasant to use. 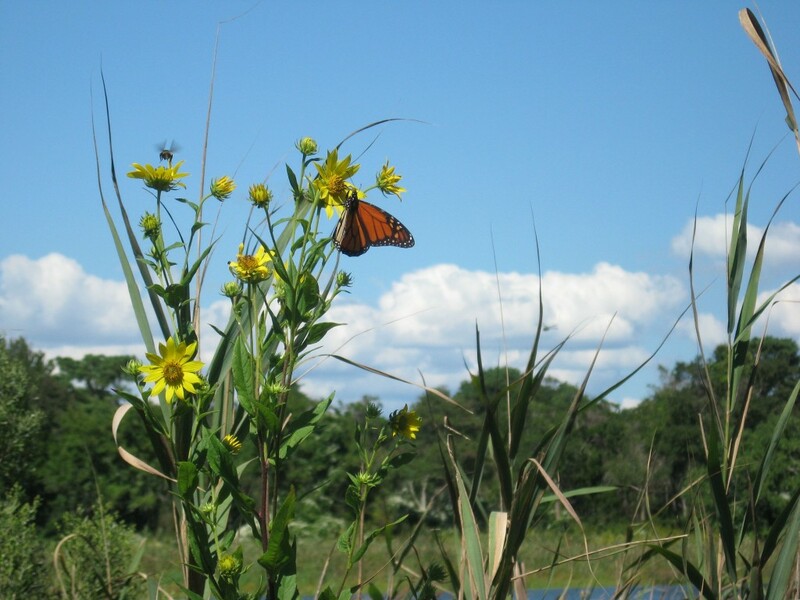 The Monarch butterflys were everywhere. 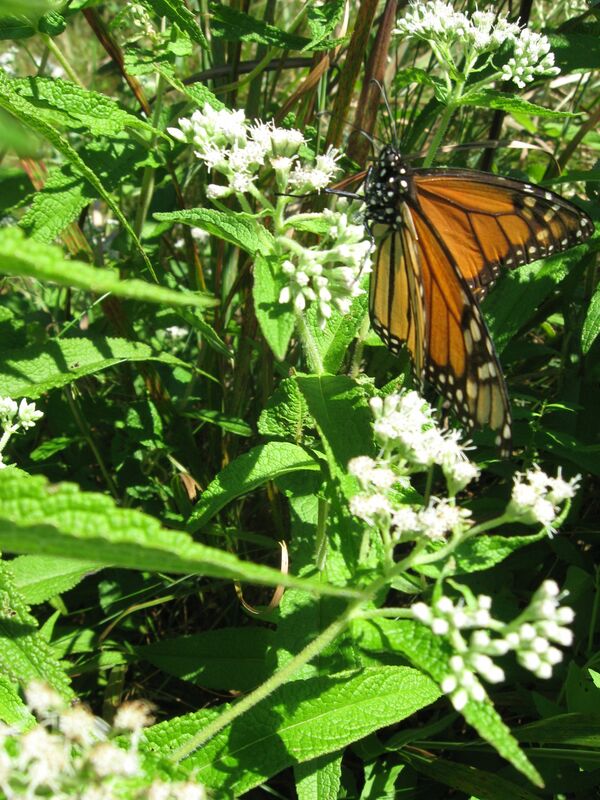 This one is visiting Boneset, Eupatorium perfoliatum. 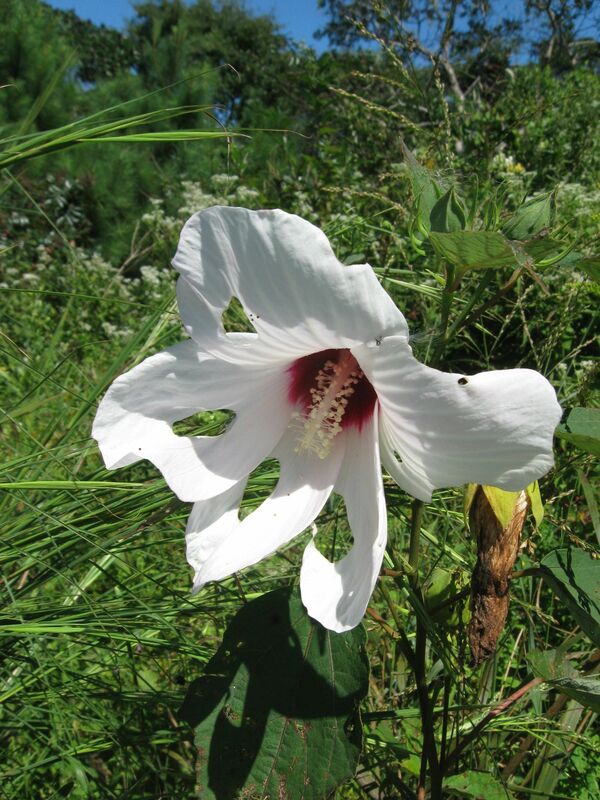 This is the first time we have ever seen the Hisbiscus palustris, above. 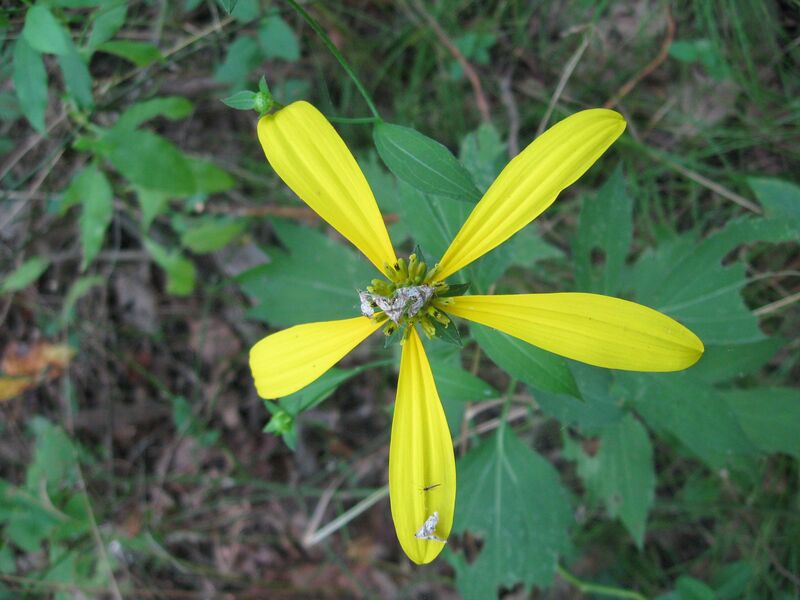 The flower is smaller and it does not have the red center like the Hibiscus moschutoes. Above, the Hibiscus moscheutos. Some creature has eaten away at this flower, creating these interesting holes. 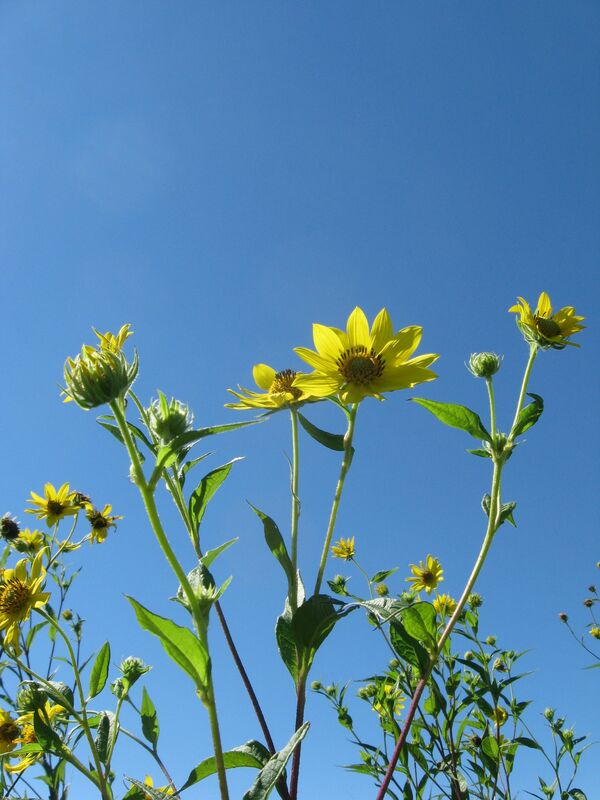 The Butterfly and a bee are very interested in this sunflower. 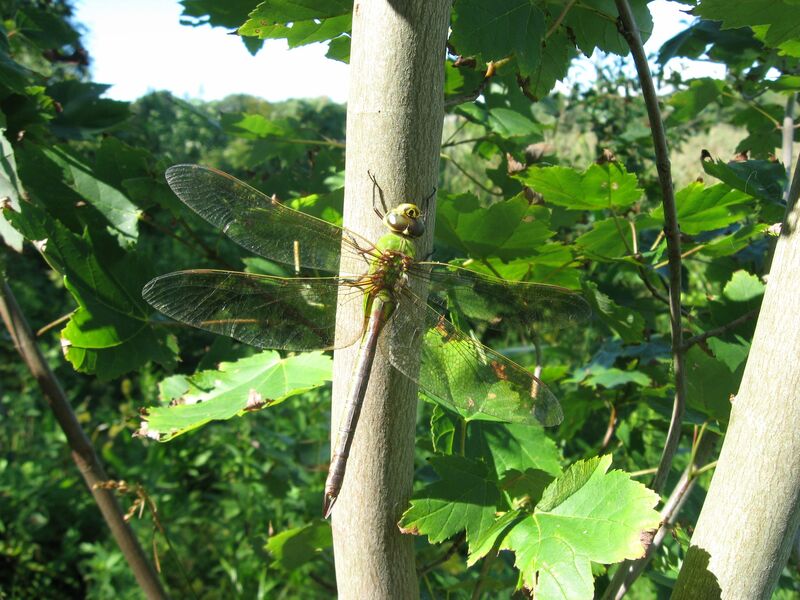 Isabelle saw this dragonfly out of the corner of her eye. 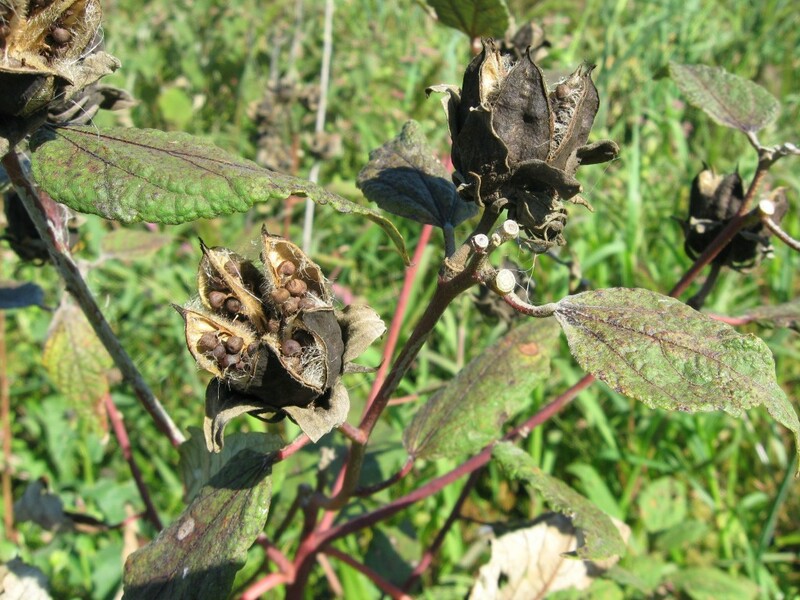 When the Hibiscus goes to seed, its a different story than the delicate and ephemeral flower. 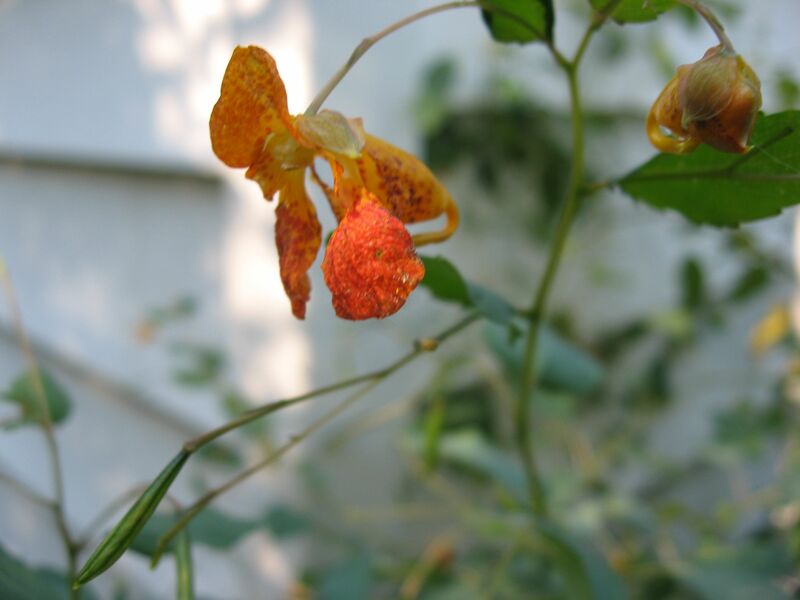 The seeds are tough creations nestled into a rigid encasement which holds on to the plant and eventually will fall off . On our garden specimen, we have let the seeds fall where they may, and now two years on we have seedlings sprouting up! The Cape May Point Lighthouse. 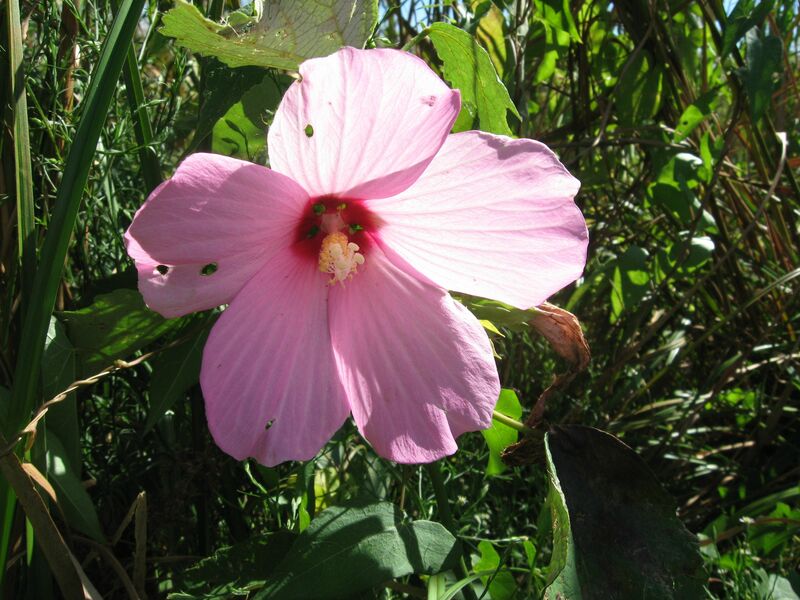 This is the pink variation of Hibiscus moscheutos. 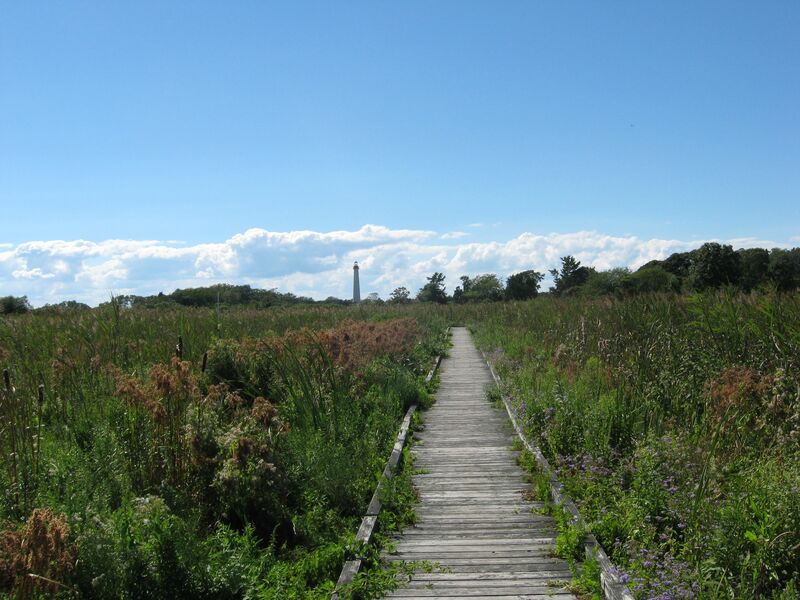 The network of trails in the freshwater marsh opens up to a beach, with the Atlantic ocean crashing aggressively against a steeply pitched shoreline. We later learned at the museum on the premises, that the shoreline is being degraded, and that it used to much further out. So far a small town and a trolley line have been consumed by the intruding ocean. A giant concrete monstrosity from WWII is next in line and it teeters on a foundation of wood pilings just below the sand. If you like clouds, this is the place. With the migrating butterflys and birds, the lighthouse, and the whole effect of the peninsula, we got the feel of a place that is a sending off and receiving area for the continent. 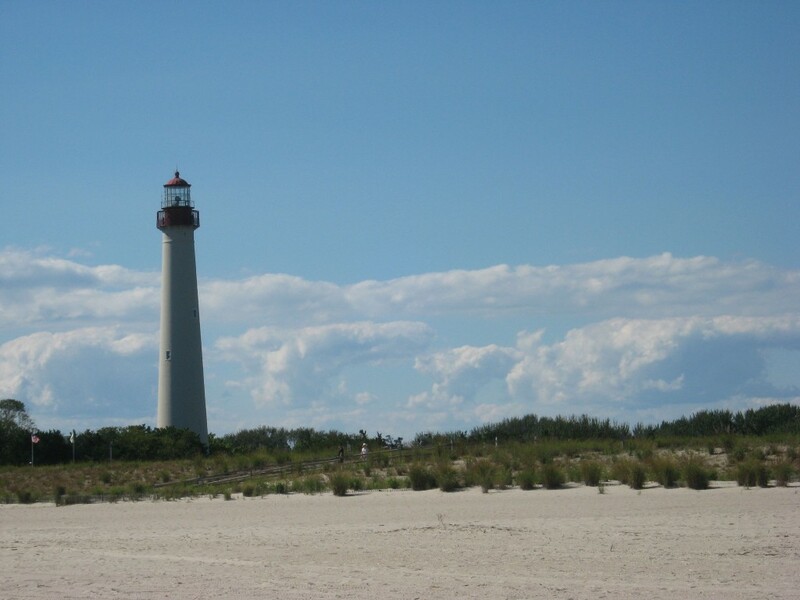 Cape May has a remote and seafaring quality that we find intriguing. At the end of the afternoon, we had seen a sensational and enduring panoramic of the vast sky and ocean. This is the very beginning of Fall, where the days are the same length as the nights. We could really tell that Fall light as the equinox approached. Suddenly it really felt different outside. Remembering the Spring Equinox, it was the same, all of a sudden that Spring light was upon us, and the Winter light was gone. 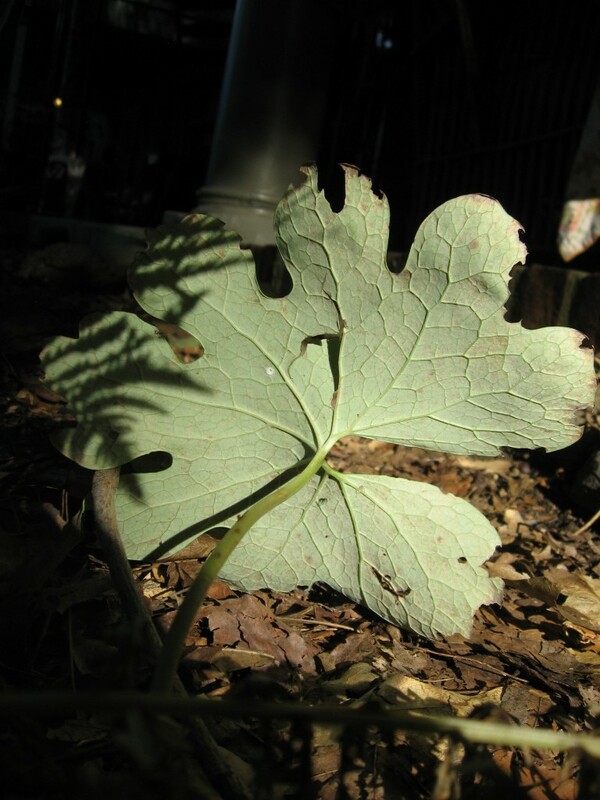 The Bloodroot emerged from the layer of dead leaves and bloomed. Today, we feature a couple of Spring plants that have made it into the Fall. 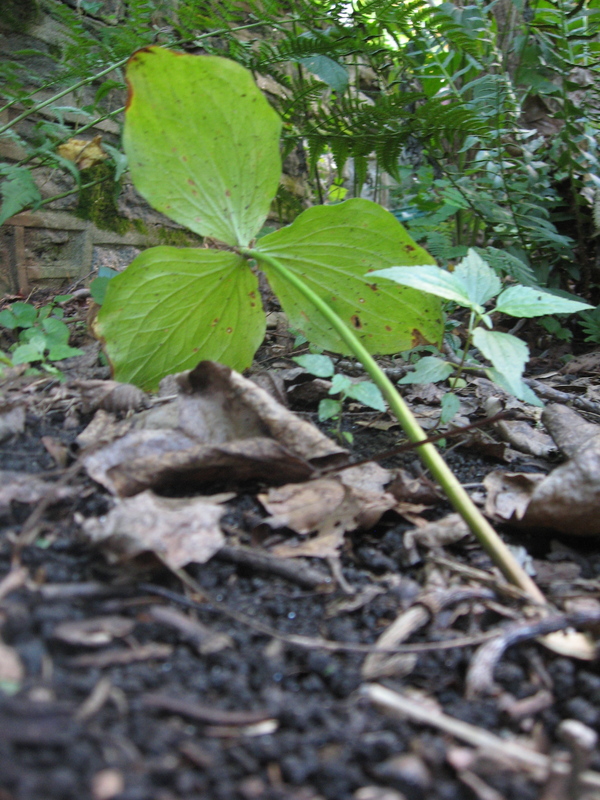 This Bloodroot plant is still hanging on, spending the summer under the deep shade of a mature Sugar Maple. 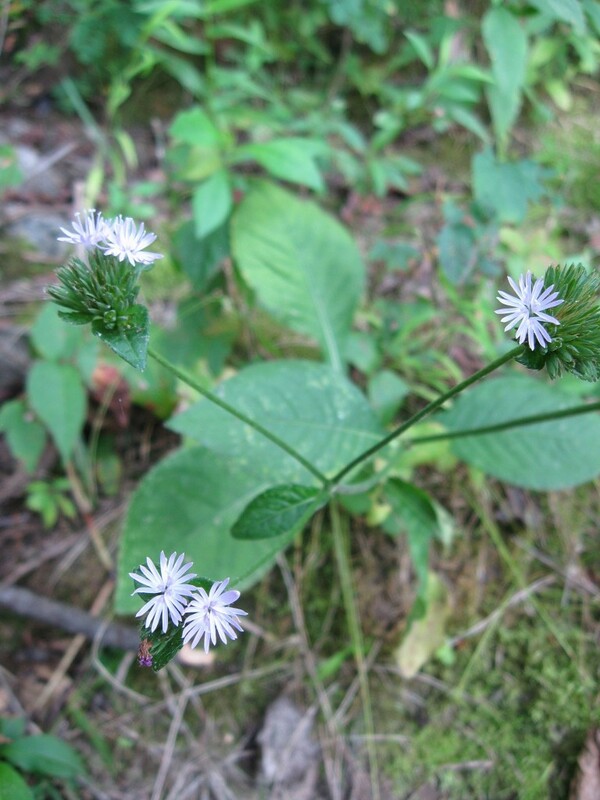 This is the same specimen, with the silvery underside exposed as this plant drops to the ground. 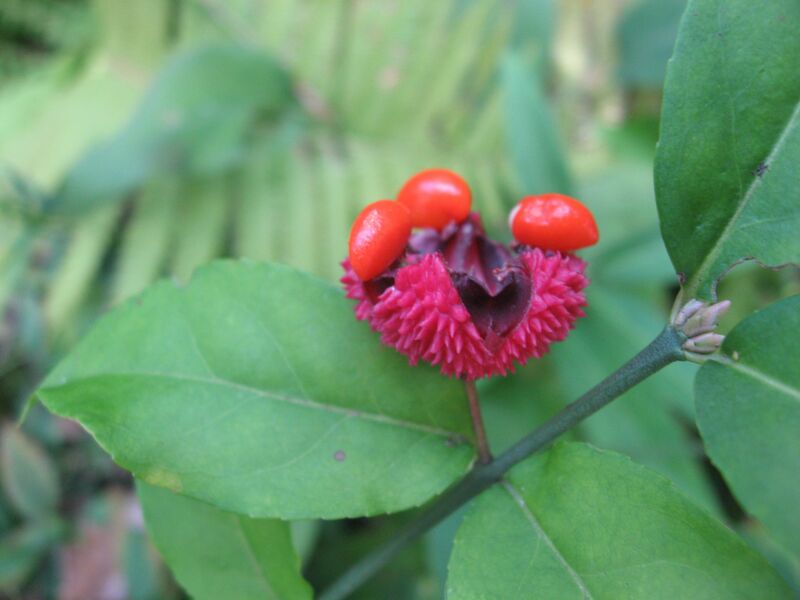 The one fruit on our Euonymus americana specimen, the Hearts-a-Bustin’, has opened up in a glorious display of fall color and bounty. 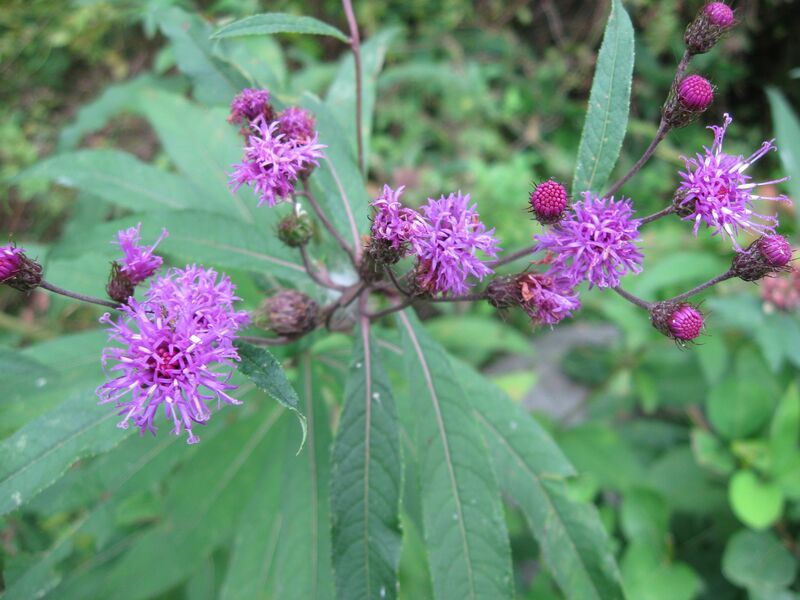 Our Joe -Pye-Weed is turning colors, its seeds blowing away in the wind as we intended. 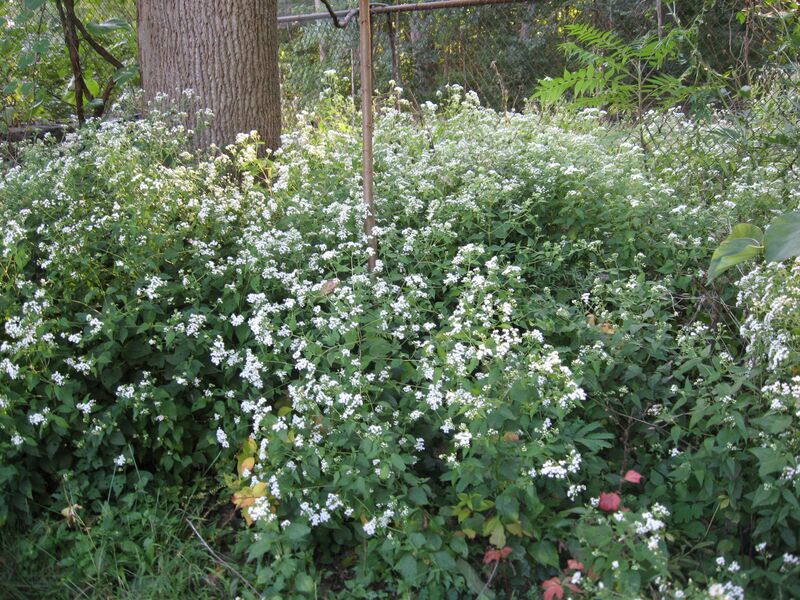 The snakeroot which is trying to take over the whole yard, is finally blooming in a fantastic display of glowing white flowers. The Jewelweed collection, which consists of both the orange Impatiens capensis and yellow Impatiens pallida has been a huge favorite with the bees this summer. 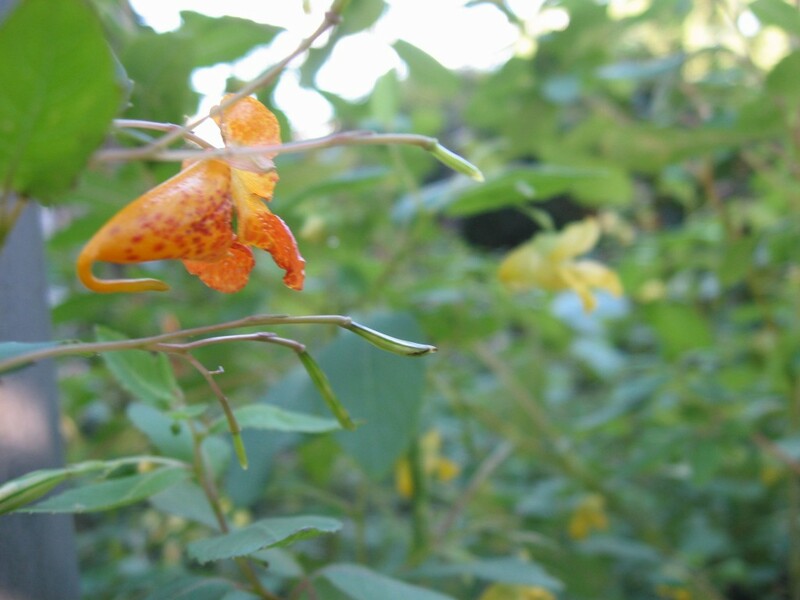 Above, the Yellow Jewelweed, (Impatiens pallida) and below the Impatiens capensis. Like the Bloodroot, this Trillium Grandiflorum, which had a spectacular white bloom in April, is still around, surviving under the shade of an American Elm. 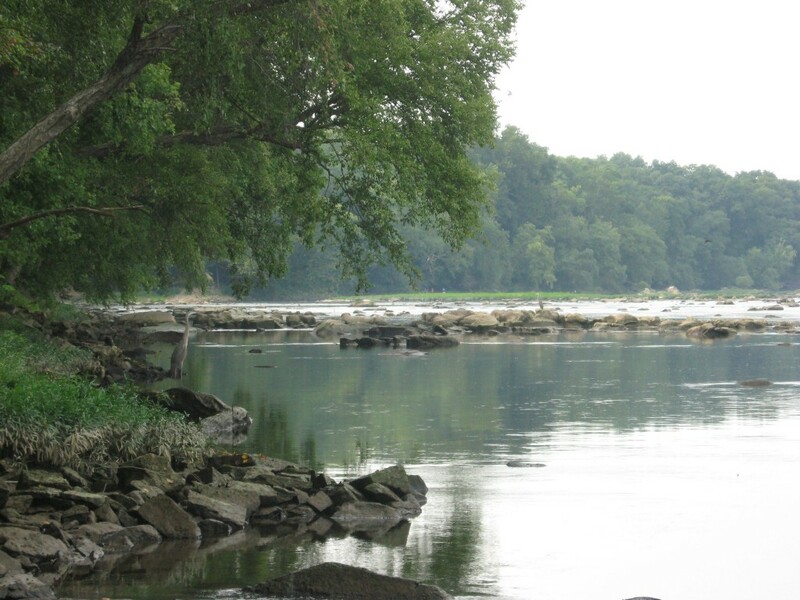 Summer has matured elegantly along the lower Susquehanna River in Maryland. We are greeted with the rich, sweet, aromatic fermentation of the Paw-Paw fruit that has dropped to the ground, along with the pleasant sight of the Paw-Paw trees laden with their large bountiful fruits. 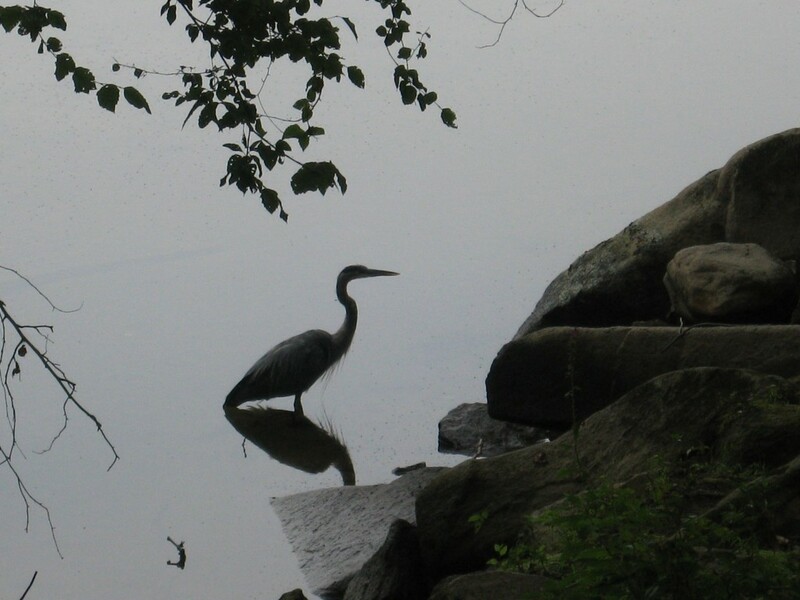 Great Blue herons taking their afternoon rest along the colorful shores, bright with blooming yellow sunflowers and Red Lobelia. 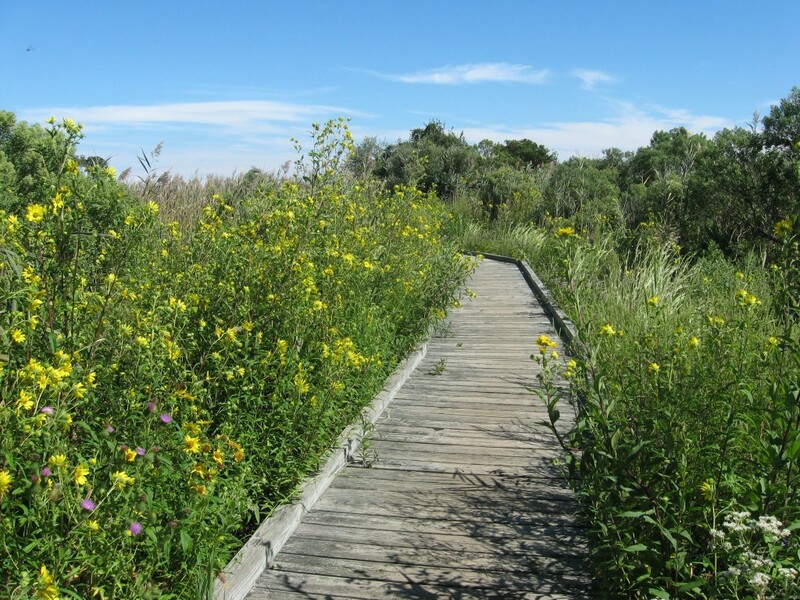 This is the place and time to watch birds and the flowering plants that ultimately sustain them interact with the mature season. 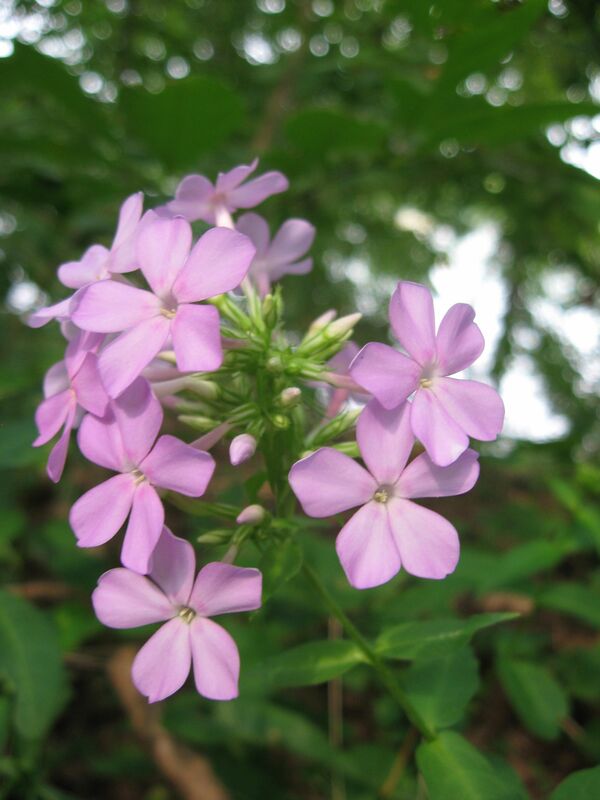 We discovered Sensitive Fern and Phlox, growing wild and blooming amidst the shade of Silver Maple and Sycamore. 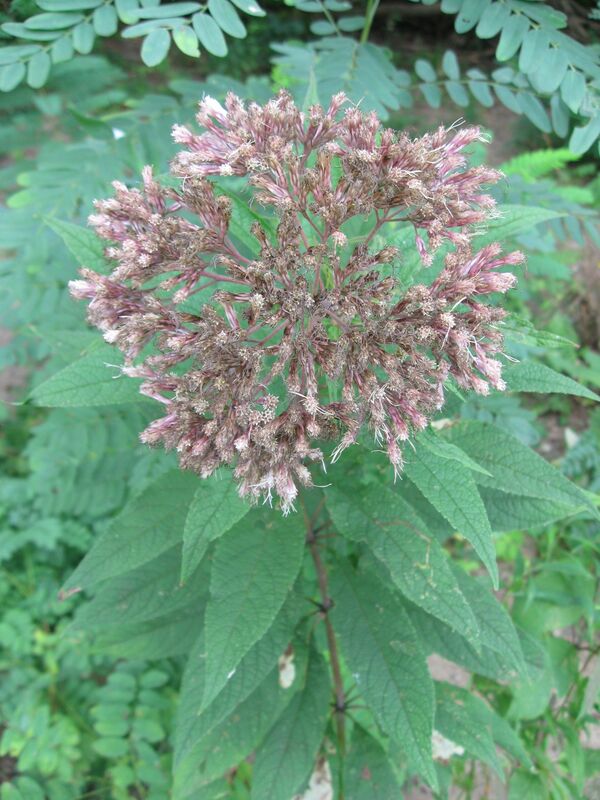 Joe- Pye weed was at the very end of its flowering cycle, and many specimens were already in seed. 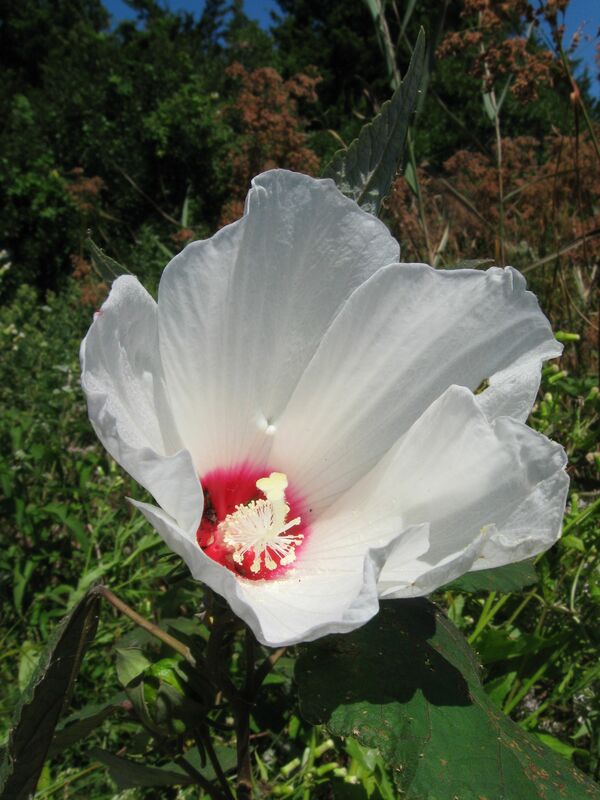 We found Carolina Elephant’s Foot blooming. ( Elephantopus carolinianus). 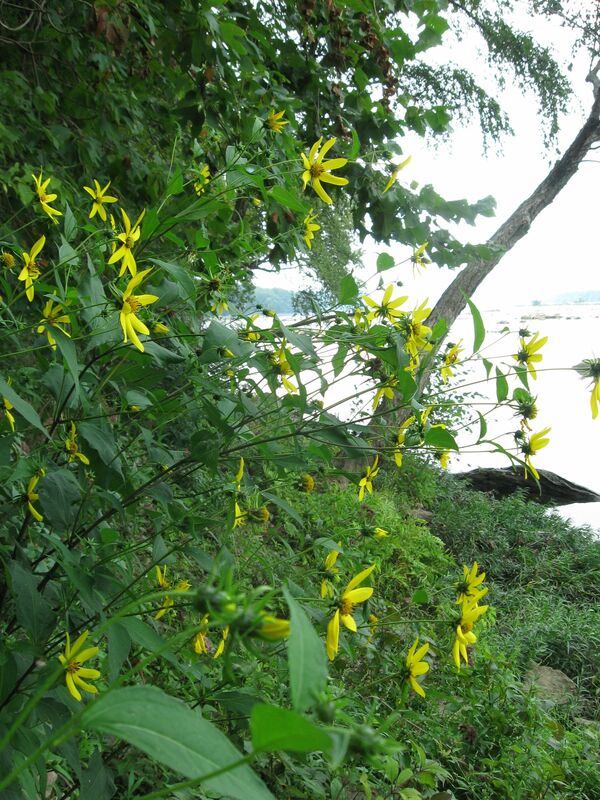 This plant, Elephantopus carolinianus, pictured above is endangered in Pennsylvania but is growing in abundance along the shore of this part of the Susquehanna River. Reaching for the light below the Silver maples and the Sycamores. The summer is coming to its end. In these parts, last year, it was a very wet August, and this year a much drier one. 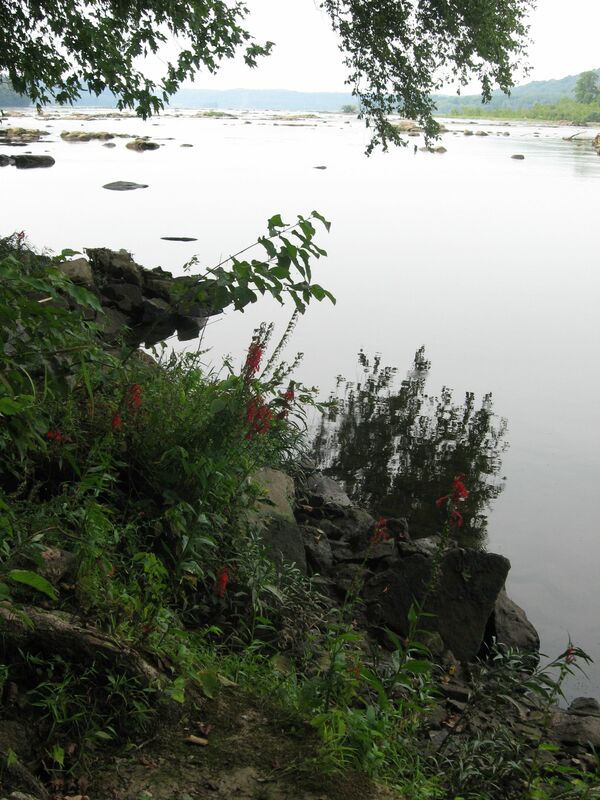 The lobelia last year was of a robust size, and pictured growing out of the swelling Susquehanna. 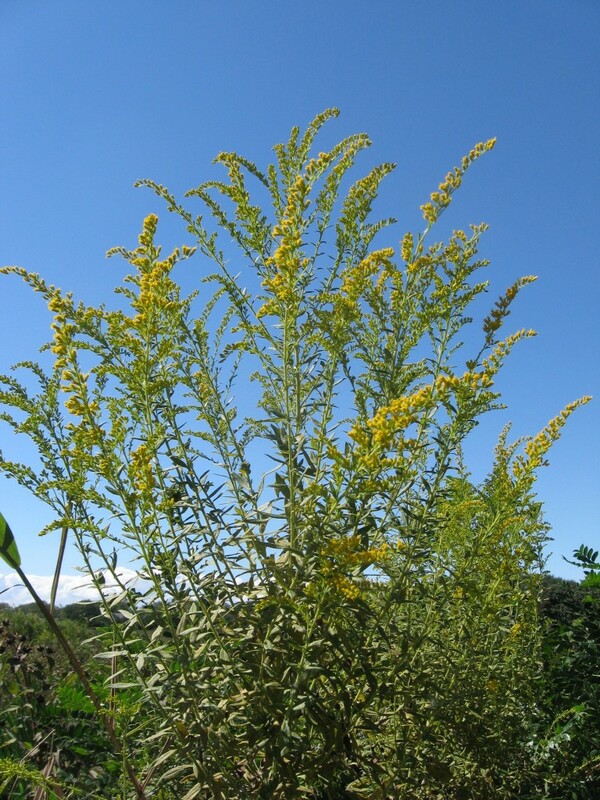 This year the plant was reduced in size, with the river about ten feet away. The trail went along an old abandoned rail line for about a mile, and then it spun off by itself into a rich floodplain. We could smell the fruity aroma of the fermenting Paw-Paw, rotting into the forest floor. the 3/4 inch long dark brown seeds, about ten to fifteen per 4 inch fruit are considered hydrophyllic, which means they need to stay moist in order to remain viable and have a chance of sprouting. If they dry out for a few days, they will most likely not sprout. 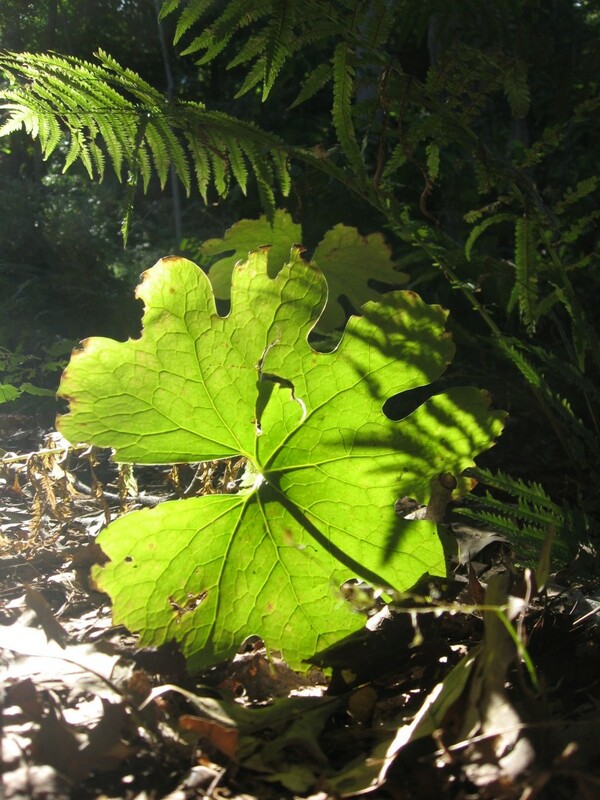 The juicy fruits slowly decay on the forest floor, keeping the seeds moist until the next rain, or until the leaves from the dense silver maples or the tall white oaks and Sycamores lose their leaves, covering the decayed fruits and helping them retain their moisture. The cover of leaves will bring them through the winter where the seeds undergo another necessary condition for sprouting, which is a prolonged period of cold temperature called cold stratification. 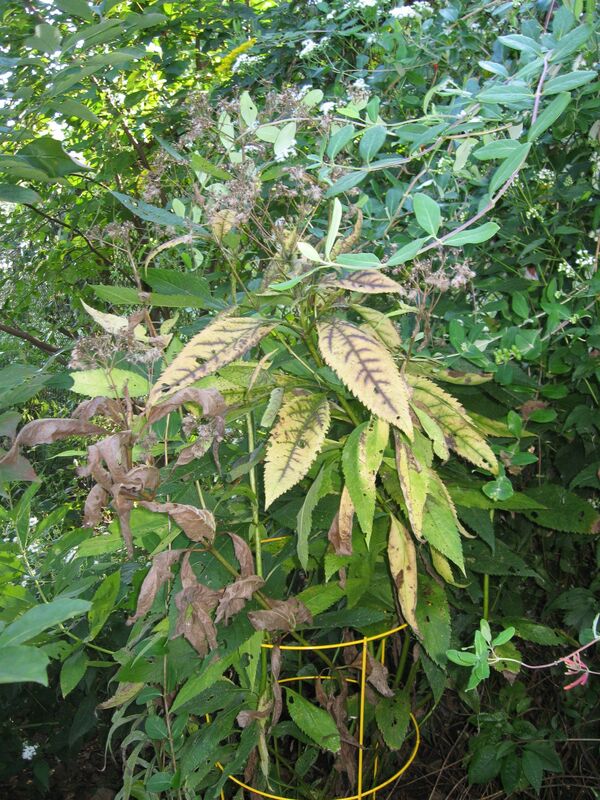 Many of the plants growing before our eyes require winter to survive as a species. 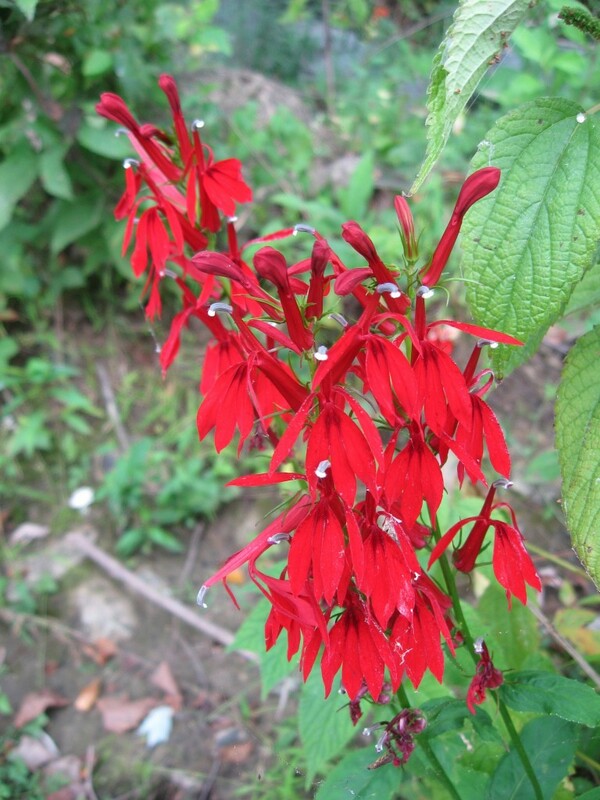 The Red Lobelia requires hummingbirds to visit them and deliver pollen from another Lobelia plant in order to produce fertile seeds. 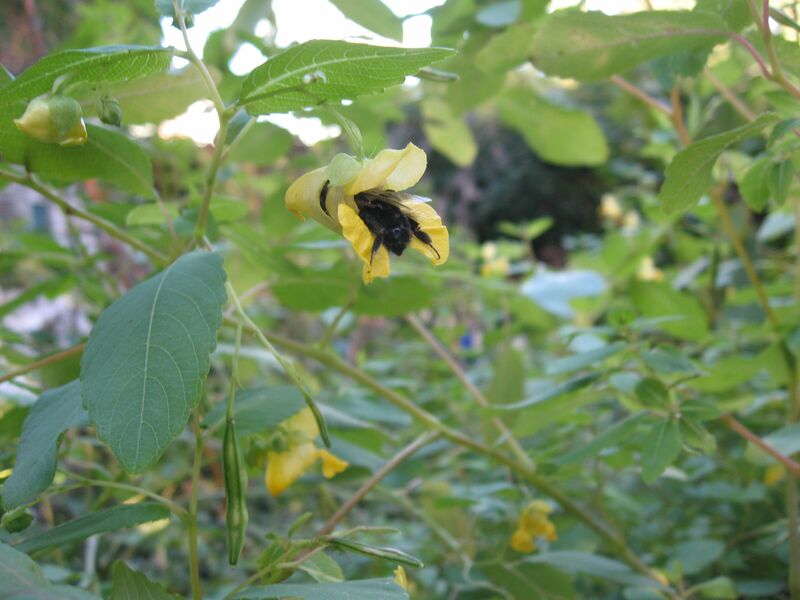 The Paw-Paw tree also requires pollen from a distinctly different population of trees in order to produce fruit and viable seed. Many groupings of Paw-Paw trees found in the woods are actually one plant that has spread from rhizomes, and the trees are self-sterile, which means an individual specimen of this species cannot pollinate itself. 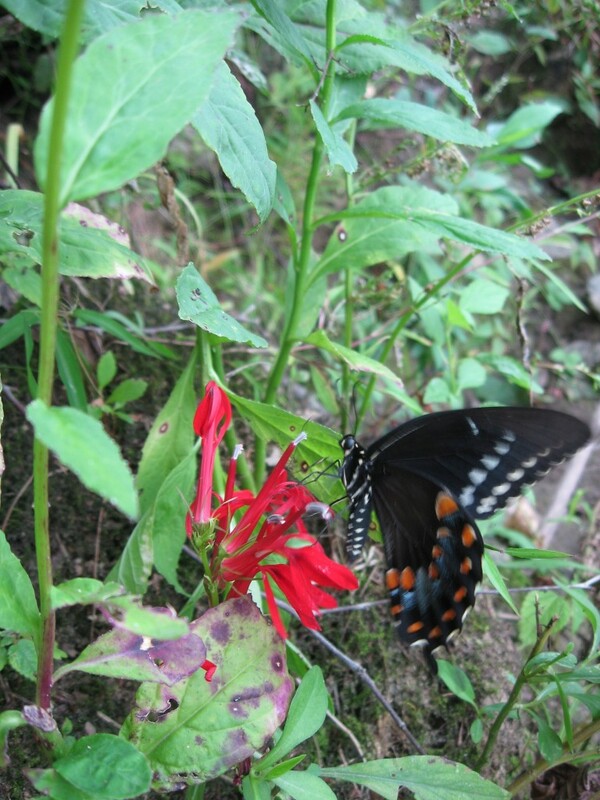 The hummingbirds are dependant upon the Lobelia for its life-sustaining nectar, as the lobelia depends on the bird for its ability to produce viable seed and reproduce. 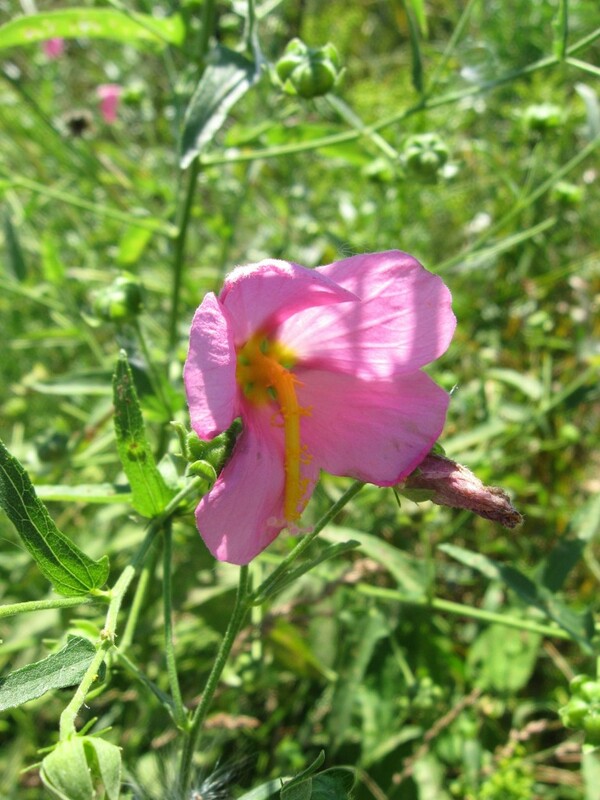 With many of the species of plants we have studied, genetic diversity is a consistent theme, as well as genetic provenance. 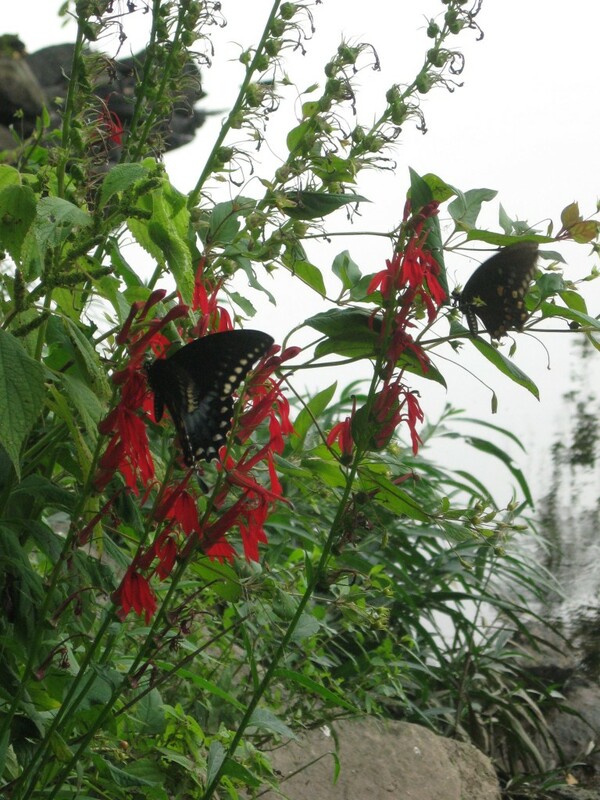 When we see these plants and their associated birds, watching them interact from our widow into the garden, or from the riparian wild of the Lower Susquehanna, the face of these two species become interconnected; one cannot be without the other, so to see the Lobelia is to see the Hummingbird, and to understand these two species as a recognizable component of this ecosystem is an achievement. This awareness is a satisfying part of our afternoon walk. In this field of learning and education, every species has something to tell us. Not every seed of the Paw-Paw tree survives. Many dry up and return to the soil as organic matter, ready for the next iteration of life. The Lobelia seed will require the wind and the flow of water to travel to the next suitable destination to be possibly sprouted. The thousands of tiny seeds are of no interest to birds. The seeds must travel for the species to survive, because the plants require that genetic diversity. 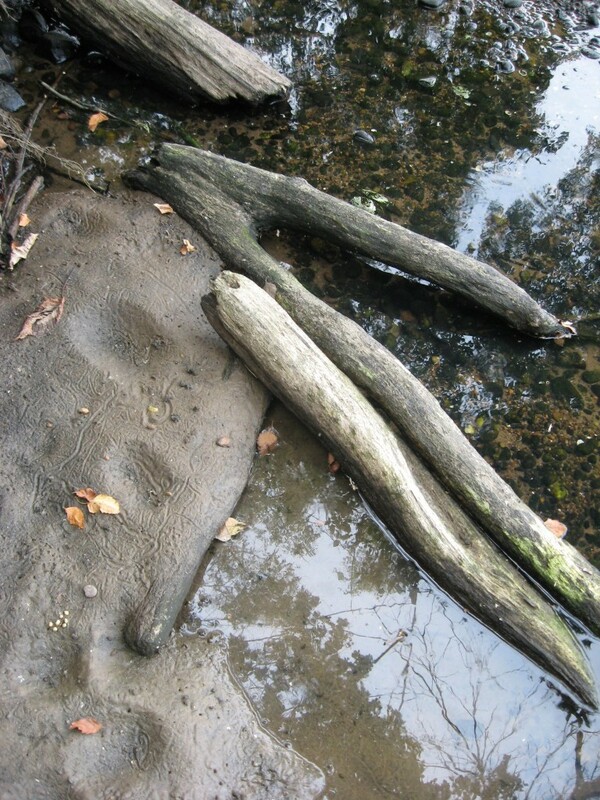 In this above photograph, which appears as a pool of life, there is a flow from one place to another, as the pool is indeed an ancient river, and what is also depicted is a timeless quality: The species and rocks are older than we can comprehend displayed in a morphology that spans a scope of millions of years. Thinking about species and geology out in the field on this late summer day, while the remnants of a hurricane begin to pass over us, the humidity stifling, we find ourselves in a distinct time and place in the history of the earth. Looking into the color and stature of any plant, there is a story to tell; one that unlocks the mysteries of the universe, each one can tell a story of fabulous chemistry and startling physics, an impressive biological tale that most likely spreads over astounding geographical regions and often within the stories to be told among the vast collection of knowledge classified as the study of botany, there are continental variations on the same species or family originating from Pangea. 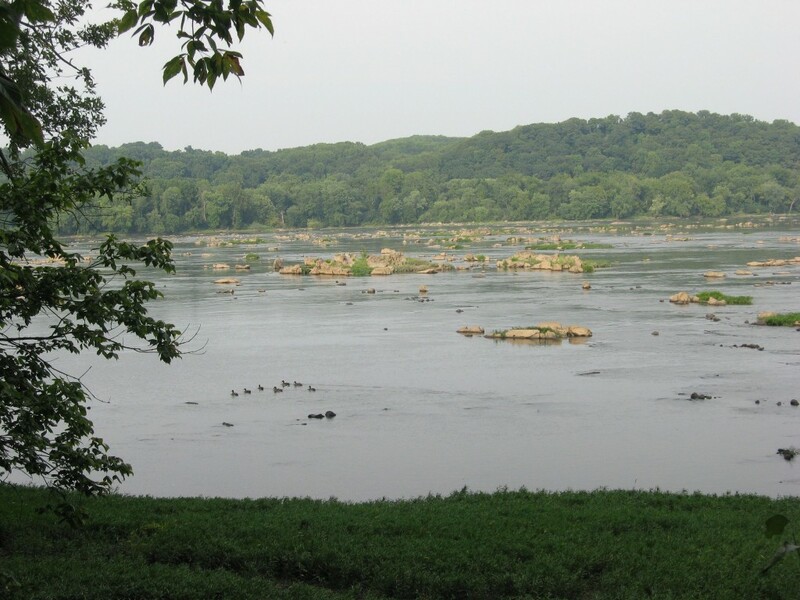 The rocks in the above picture have existed for millenia, however their forms have been changed drastically as they have been eroded down to these stubs from the flow of water past them. However the form that they are in presently will most likely remain for a very long time after the individual specimens of ducks also pictured above will last. A difficult question to ask now, but most pressing is whether the species of ducks will be around the day these rocks have weathered away? 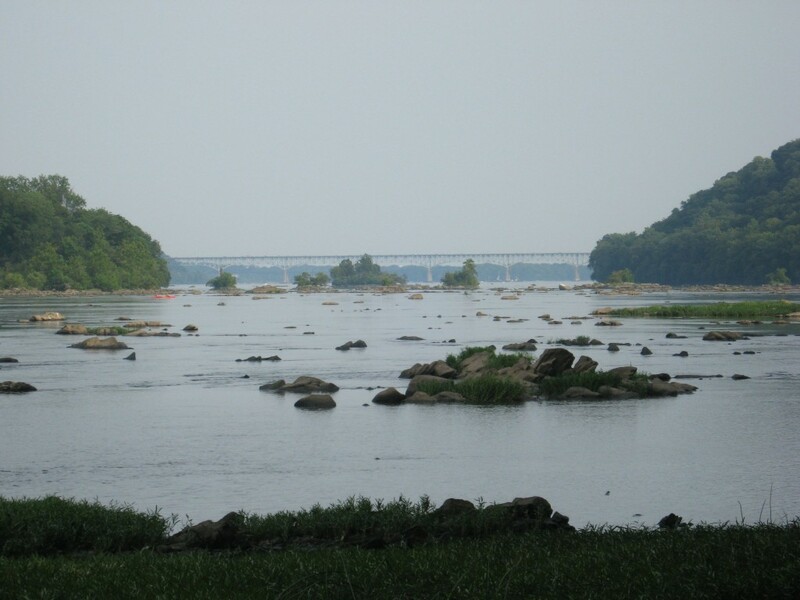 Above, we reveal the timeless,bountiful and grand wilderness to you as someplace that is as accessible and familiar as the I-95 corridor between Philadelphia, Baltimore and Washington D.C., it’s bridge pictured above. This is the bridge near the Maryland toll booths, just north of Havre de Grace. This bridge is a link between some of the most densely populated regions in North America, an infrastructural component of the human ecosphere. We rode over this bridge on the way to this magnificent site and we both looked out the window in anticipation of our arrival: This is the place, our destination. So then, with all of these thoughts of species, time and geology, the spectacular vision of nature outlined before us all as we sit humbled and pensive, our minds in a wonderous state just pondering this magnificent world we have stumbled upon and have realized is before our senses; this world, like the ripe fruit of the Paw-Paw tree, a sweet and complex tasting world, like the fact that each grouping of Paw-Paw trees has a different tasting fruit, much like that of the well established provenance of wine regions, there is a world before us that is sweet and is fermenting, full of distinctions and subtleties, a world that relies on diversity and survives on a rough regimen of loss where the dead are ultimately the soil we survive on: now on comprehending our own species, we are best to contemplate these thoughts in the comfort of your own favorite natural area and be rest assured that we will end up in a beautiful place. 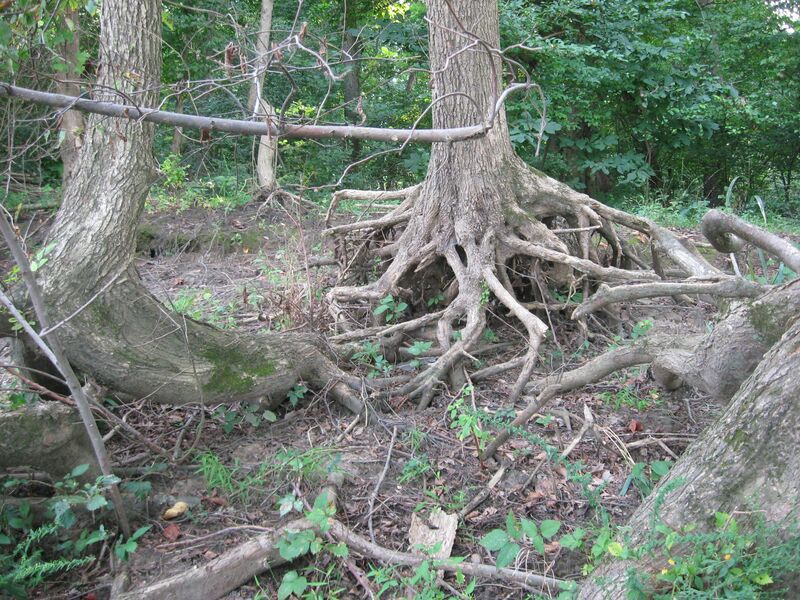 American Elms (Ulmus americana) grow out of the rivers edge. Comprehending our own species, passing over that bridge on the superhighway from city to city, or studying and conserving the natural area known as Susquehanna State Park, Maryland, appreciating the beauty of the other species and understanding that there is a complexity of interactions that needs lifetimes of study and comprehension to fully realize the whole or something resembling a whole, right beside our daily needs and consumption, our species exists. 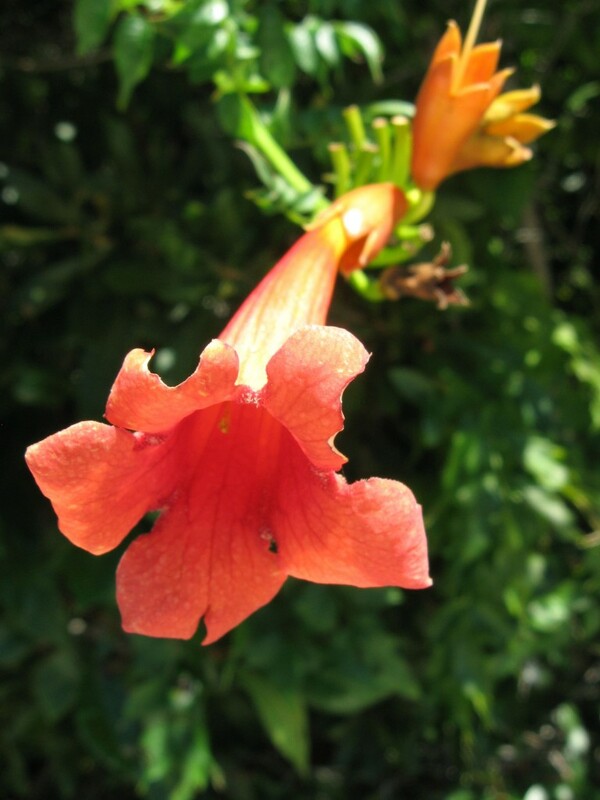 We can study and comprehend the Lobelia, the Hummingbirds and the Paw-Paw tree, just a few, as a species, and we can destroy the habitats of these other species in a flash. Like the rest of nature, our species is diverse and volatile. However, now that we can comprehend this world with such panoramic sensibilities, our species evolution is imminent and most certainly dependent on the fate of our many and crucial neighboring species. 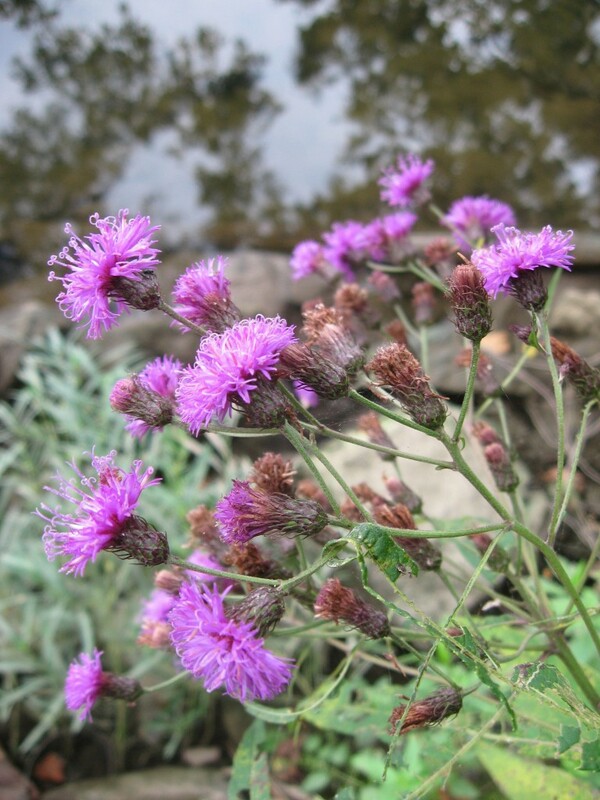 Which plant and animal do we most depend on? (Arisaema triphyllum) , Jack -In-Pulpit. 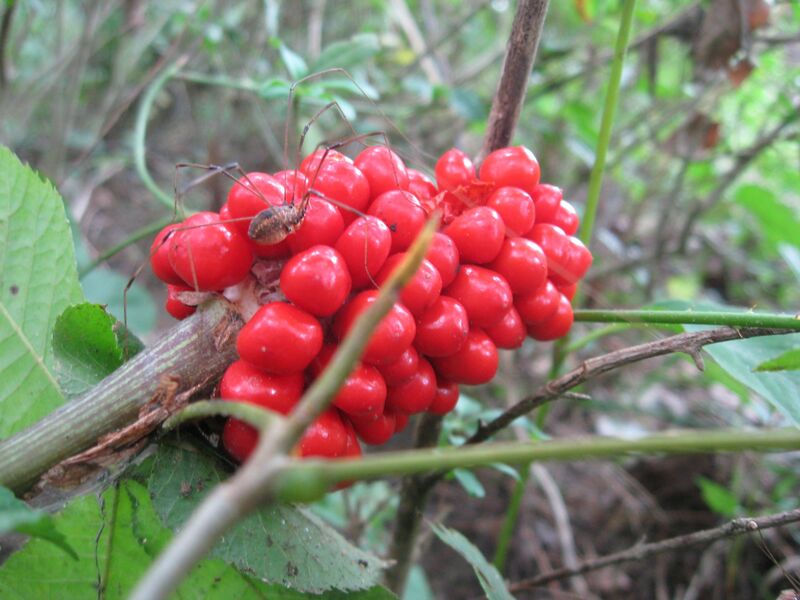 The bright red fruits of this woodland herbaceous wildflower are a common occurrence on the forest floor. 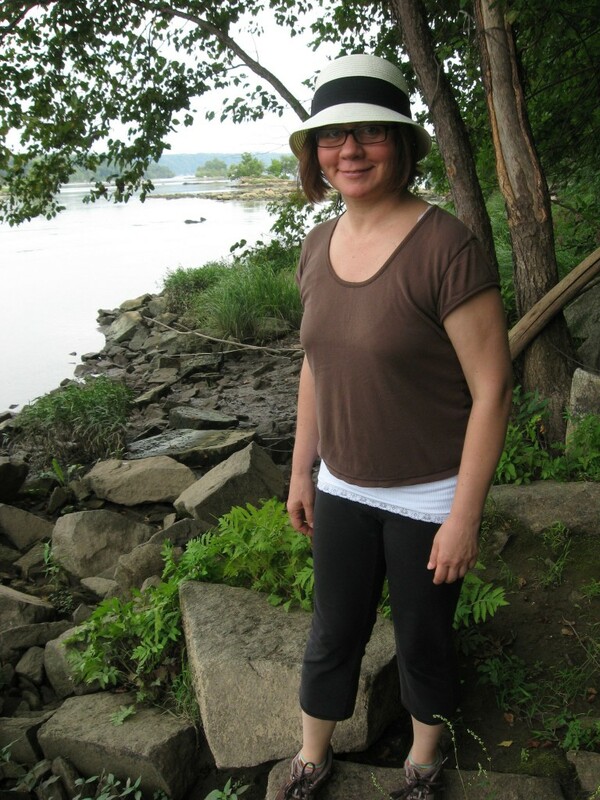 There is nothing more instructive than to visit a 300 million year old layer of shale in Pennsylvania’s Susquehanna River watershed that has been exposed to the earth’s surface, find a loose chunk of the rock and whack it with a hammer just enough to loosen it, and then pull it apart to find a fern fossil inside. 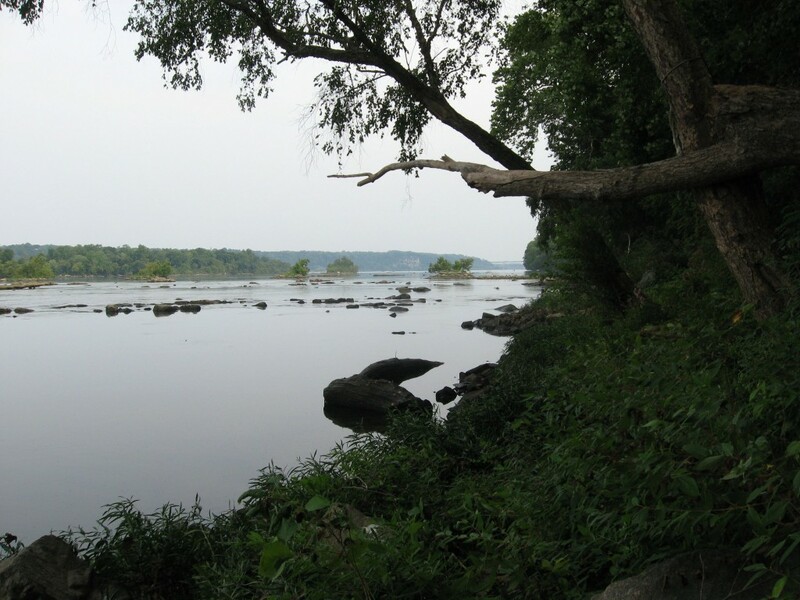 Considering that The Susquehanna is in danger from contamination in the current frenzy of natural gas drilling, we must pause as a species to reflect on our evolutionary record: Compared to the species that survive the long haul, how do we quantify and examine the necessary adaptations in a way that can give us an innate understanding of what is required? 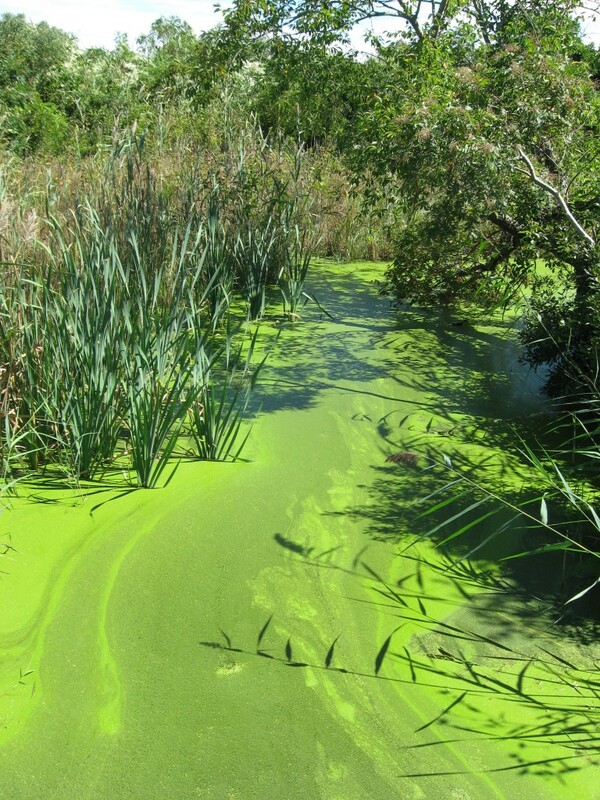 How does polluting our rivers give us an advantage, especially when so many individual and collections of specimens of our species speak out and organize against this? What do we need to do to really adapt to maintain our survival and not destroy other species? Humans are most certainly no ferns on this matter. The rocks are packed with facts about species and life and death on earth. With the drastic changes made to the habitats that support our species, we must pause before the hard evidence below our feet before we consider our fate. 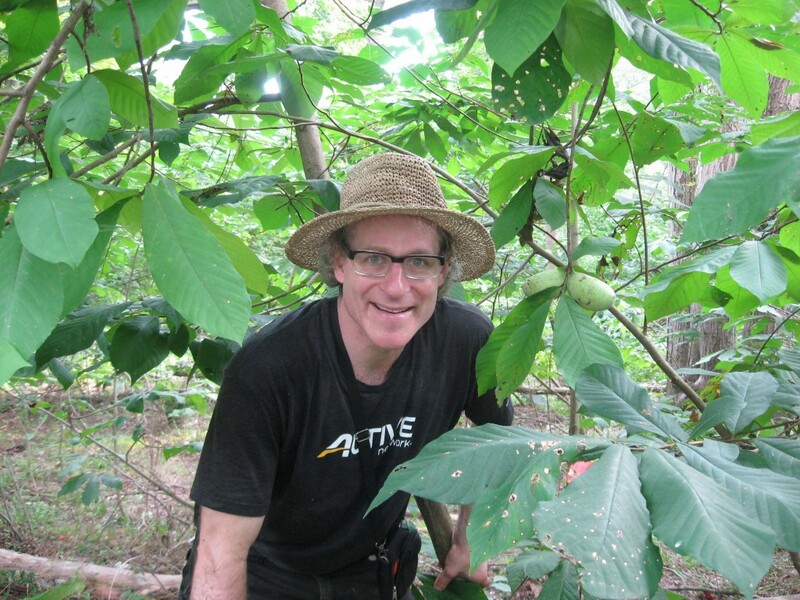 The ripe fruits of the Paw-Paw trees, so heavy they pull the trees closer to the earth, and so richly aromatic in a ripe and full forest. The end of summer has arrived.